News Photo by Jonny Zawacki Onaway quarterback Gavin Fenstermaker (7) scrambles for a first down during the second quarter of a Midwest Central Michigan 8-Man football game against Charlton Heston on Thursday at Onaway High School. ONAWAY–A week after knocking off the defending eight-player Division 1 state champion, the Onaway football team was ready to put on a show in front of its home crowd. The Cardinals were able to build on the momentum they gained after a big Week 1 victory and lit up the scoreboard on their way to rolling Charlton Heston by a final score of 70-14 on Thursday. “That was our big thing, we have to build every week. We have to get better every week. We had some film and kind of knew what they (Charlton Heston) was going to do and the kids practice well all week and showed it. I can’t take much credit,” Onaway coach Steve Klinge said. 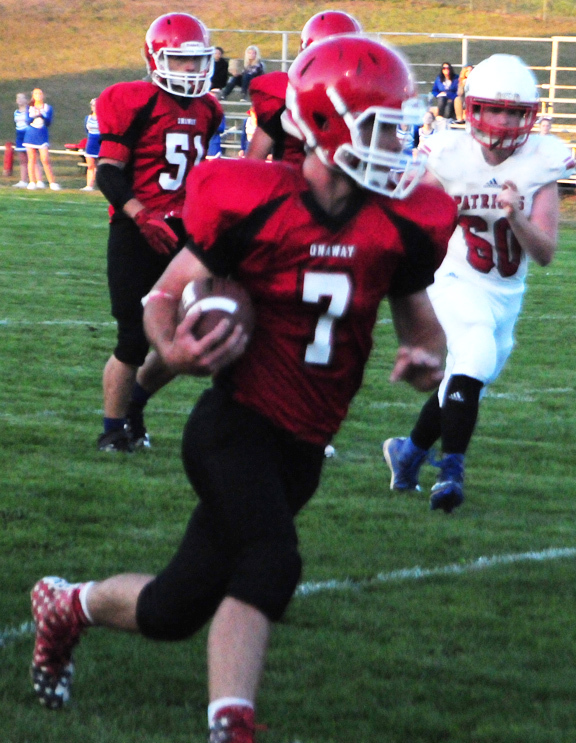 Onaway (2-0) forced a turnover on the Patriots opening possession when Gavin Fenstermaker stepped in front a pass and picked off Patriot quarterback Brandon Austin. The Cardinals took over at the Charlton Heston 12 yard line and four plays later, Fenstermaker rumbled up the middle for a two yard touchdown. Charlton Heston (1-1) showed some life early and had success through the air. The Patriots were able to tie the game up at eight apiece when Austin connected with receiver Devin Schwemle for a 33-yard pass and catch for the score. The first quarter touchdown was one of the few bright spots for the Patriots as the rest of the game belonged to the home team. Onaway shut down the Patriots passing attack and were stingy defensively throughout the remainder of the game. Dawson Hilliker gave Onaway the lead with just over three minutes left in the first quarter when he scampered in for a 16 yard touchdown. Once the Cardinals regained the lead, they built on it the rest of the way. Brendan Hilliker scored the third touchdown of the quarter when he powered his way in from 12 yards out to put the Cardinals ahead 22-8 after one quarter. Onaway added three more touchdowns in the second quarter, two of which came on the legs of Fenstermaker, who finished the game with 126 yards rushing on 12 carries and reached the end zone four times. Brendan Hilliker scored once in the second quarter and finished with 99 yards on 14 rush attempts and found paydirt twice. The Cardinals led 40-8 at the half and continued the onslaught in the second half. “It feels good obviously to get a win anytime, but to get a win here and start a new tradition here is important. The biggest thing is we’re trying to teach these kids it’s about more than just the wins,” Klinge said. Fenstermaker scored his final touchdown just over a minute into the second half as he made several nifty moves and sprinted into the end zone from 43 yards out to help the Cardinals build on their lead. Austin Nash replaced Fenstermaker at quarterback and found the end zone with a 10 yard run. Joey Galvez took an end around 25 yards for a touchdown on his first of only two rushing attempts on the night and Brendan Fenstermaker scored the final touchdown for the Cardinals with a 21 yard touchdown run. The Patriots added their second score of the night when Austin once again hooked up with Schwemmle, this time from 28 yards out. It was too little to late and Onaway cruised to a big victory to remain unbeaten and earned its first home win of the season and first Midwest Central Michigan Eight-Man Conference win. The Cardinals will host Posen next Friday in what could potentially be a matchup of two undefeated teams.